The Blues had offered a new contract to the 27-year-old, who joined in 2014. Anscombe was Wales' first-choice 10 as they won the 2019 Six Nations Grand Slam but his regional future had been a source of speculation during a period of uncertainty in Welsh domestic rugby. Anscombe has been an influential player for the Blues, scoring 597 points in 76 appearances and helping them win the European Challenge Cup last season. He has always signed national dual contracts with Blues and Welsh Rugby Union since arriving from New Zealand in 2014. But Welsh rugby has introduced a new player banding pay system to replace NDCs with the wages and categories set by the new Professional Rugby Board (PRB). Anscombe appealed against his pay banding verdict but that was rejected. Following that news, Blues head coach John Mulvihill said they had given him a deadline of early this week to decide on his future. 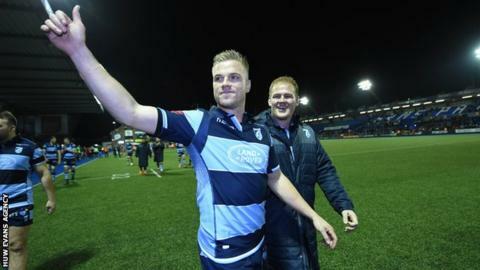 Despite reported interest from English clubs, Anscombe had to stay within regional rugby if he wanted to play for Wales. If he moved outside Wales Anscombe would be ineligible as he has not played in 60 Tests. The winner will achieve a Champions Cup play-off place with the game being played in mid-May - which means Anscombe could play a part in helping his current side beat his future employers in that match.